Home / Patient Info / Comeback Stories » Kathryn W, a high-level track athlete of Batavia, IL, has always been extremely active. Kathryn W, a high-level track athlete of Batavia, IL, has always been extremely active. While competing in the most physically demanding collegiate track events, including pole vaulting and hurdling, Kathryn noticed progressive hip discomfort. Her senior year of high school, Dr. Domb diagnosed her with impingement (FAI) in her left hip. The pain continued to worsen through her track season, and progressed to where she was unable to walk. Dr. Domb performed surgery on Kathryn's left hip on June 16, 2010, just before her freshman year of college. Three months later, Kathryn was back on the track and competing in all the same events pre-surgery at East Carolina University. Only one short year later, Kathryn started feeling pain in her right hip. Trusting in Dr. Domb and his ability to not only help her pain, but get her back into her track career, she had her right hip surgery on June 3, 2011. Even while still completing rehab, Kathryn reported minimal pain and was confident of her return to track the following fall. Kathryn credits Dr. Domb with assisting her return to the activities she loves at a Division 1 Athletic Level. 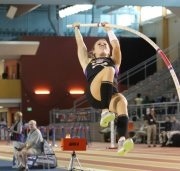 Kathryn went on to place fifth in pole-vaulting at the Conference USA Championships in 2011. "I was able to get back into the demanding routine of college track this past fall with ease. To prevent extensive damage to my hips, I was forced to give up hurdling due to the impact it has on them. Other than hurdling however, there were very few exercises that I had to take a step back from. I continued with physical therapy in addition to my normal practices and was back to where I was pre-surgery by October, just four months after surgery!" "I went on to have a very successful season. 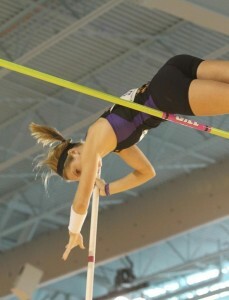 I was able to contribute to East Carolina's First place team finish at the 2012 Indoor Conference USA Championships by placing third in the Pole Vault with a jump of 12'4”, and receiving “All-Conference” honors. At the Outdoor Championships this past May, I ended with a second place finish, jumping 12'6”, while tying the school record. I finished my sophomore season, bettering my best jump from the year before by more than a foot. That is an accomplishment hard to achieve for any pole vaulter, let alone for someone who has undergone two hip surgeries!" "I credit much of my successes to Dr. Domb, because without his outstanding work, I would not be competing in Track and Field at the collegiate level, or even at all!"